I love recipes like this that take something standard (hummus) and elevate it to a new level by adding something unexpected that I never would have thought of (smoked paprika butter!). Also, although I usually focus on vegetable recipes for this blog, it's nice to sometimes make something with pantry ingredients. Especially because I was out of town over the weekend and didn't make it to the farmers' market. I do wish I had fresh summer veggies (especially corn and tomatoes) around, but this hummus definitely distracted me from their absence! I really loved this - the hummus is super creamy, the smoked paprika butter adds richness and spice, and the za'atar adds wonderful flavor. 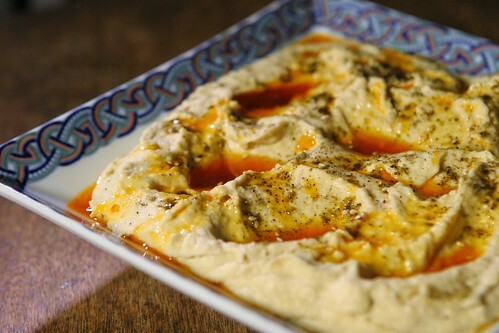 I found this recipe in Food & Wine, and according to the headnote, the chef that created it (Sameh Wadi) makes several other hummus variations at his restaurant Saffron. After tasting this one, I definitely want to try them all! If you want to save time and use canned chickpeas, you will need about 2 3/4 cups. In a medium pot, cover chickpeas with 4 inches of water and bring to a boil. Reduce to a simmer and cook until chickpeas are very tender, about 1 hour, skimming foam occasionally. Reserve 2/3 cup of the cooking liquid and drain chickpeas. Rinse chickpeas with cold water to cool. Combine chickpeas, reserved cooking liquid, garlic, and lemon juice in the bowl of a food processor. Process until smooth. Add olive oil and tahini and process until very smooth and creamy. Season hummus with salt and transfer to a platter, making deep indentations in hummus with the back of a spoon. In a small saucepan, melt butter over medium heat. Cook butter until it just begins to brown (watch carefully). Add paprikas and cook for 1 minute (remove from heat immediately if butter begins to burn). Pour the butter into a heatproof cup or small bowl and let the solids settle to the bottom. 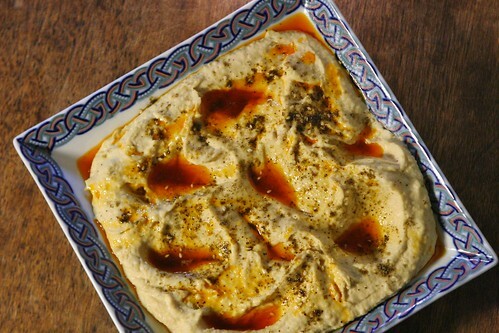 Drizzle the clear butter (discarding solids) on the hummus and sprinkle with za'atar. Serve with bread, crackers, or pita. 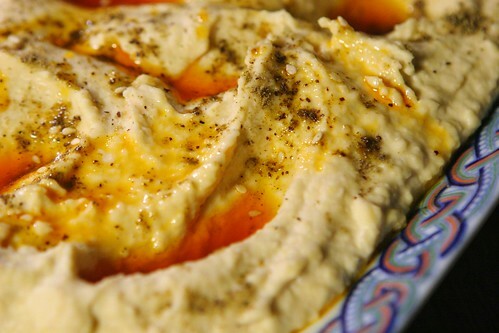 I never would have thought to add butter to hummus -- but this sounds thick, creamy and delicious! What an interesting way to serve hummus. I bet this would be a hit at a party! Smoked paprika is one of those ingredients that makes you go WOW. I love how you used it to elevate this hummus! What a unique hummus and I love that you used soaked chickpeas rather than canned. Yum!